On Monday August 20 and Tuesday August 21, U.S. Representatives Alcee Hastings (FL-20) and Ted Deutch (FL-22) toured Broward MPO Complete Streets projects in their districs. This morning, Florida Governor Rick Scott announced that the Florida Department of Transportation (FDOT) is advancing funding to start construction on the Southwest 10th Street Connector project by 2022. U.S. Representatives Alcee Hastings (FL-20) and Ted Deutch (FL-22) will tour Broward MPO transportation and infrastructure projects located in their districts. The Broward MPO and City of Lauderhill are teaming up to identify pedestrian and bicycle safety issues on Oakland Park Boulevard and identify ways to improve the corridor. 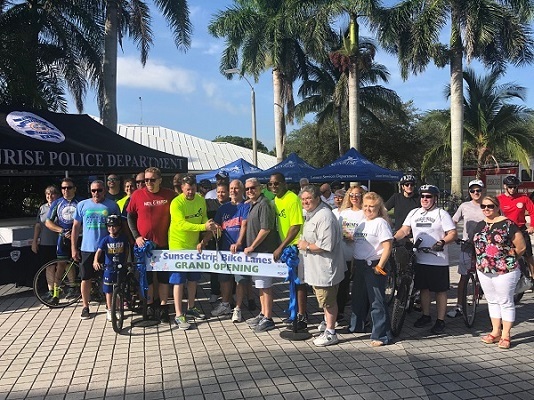 Last Saturday, community leaders, elected officials, advocates, and residents gathered at Nob Hill Soccer Club Park in Sunrise to celebrate the opening of the Sunset Strip Complete Streets project.